A rendering of the under-construction tower at Union Station. A downtown law firm is climbing from an office with a rock wall to a full floor in a new Union Station tower. Bartlit Beck Herman Palenchar & Scott will lease the entire 12th floor of Union Tower West, an office building at 1801 Wewatta St. developed by Portman Holdings. It is currently under construction. “We can’t take the climbing wall with us, but we will have something like that to reinforce that it’s not a traditional law firm,” said Eric Olson, a partner in the firm’s Denver office. Olson said Bartlit Beck has worked out of its current office on two floors at 1899 Wynkoop St. for 15 years. But as their 21,000-square-foot lease approaches next fall, the firm was looking for a place where employees could access public transportation and wouldn’t have to take different stops on the elevator. “We’re a bigger part of the building, we’re all on one floor, and there are no barriers to separate us from one another,” Olson said. In their new office, the firm’s 30 lawyers and 18 non-lawyers will spread out across 25,000 square feet. Olson said having one floor with no key fobs reflects the firm’s business model: Bartlit Beck attorneys do not receive a bigger cut of revenue from clients they bring in, which he said encourages collaboration. Bartlit Beck, which also has an office in Chicago, has 22 trial lawyers and eight corporate lawyers in its Denver office. The firm will move to Union Tower West when its Wynkoop Street lease ends on Sept. 30, 2017. Olson said the firm was represented by JLL brokers Lindsay Brown, Patrick Bolick and Tim Bourdelais. Its real estate counsel was Brian Jumps of Jumps Law. Portman Holdings’ director of leasing, Travis Garland, as well as Jonathan Jones and Robert Whittelsey of Colliers International represented Portman Holdings in the transaction. Bruce James and Aaron Hyatt of Brownstein Hyatt Farber Schreck served as Portman’s real estate counsel. Bartlit Beck will share the building with at least one other law firm. 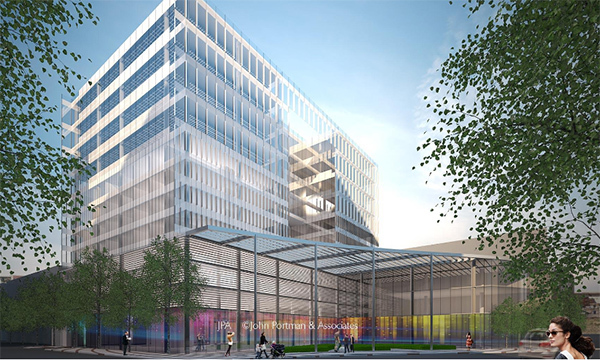 In May, the Denver office of Husch Blackwell announced that it would be the first office tenant of the mixed-use project at Union Tower West. Husch Blackwell will have 36,000 square feet on the ninth and 10th floors. Just across the tracks from Union Station, the development at 1801 Wewatta will include hotel rooms, parking and ground-floor retail space in addition to 100,000 square feet of offices from the ninth through 12th floors.